WYP: Just for openers, where is your nursery, and what’s your focus? JJ: We are in Philadelphia (150 W Butler Street). I opened the nursery in 2016. I don't sell cultivars - just straight species natives from local ecoregions, and open-pollinated if possible. (I also have a) demo garden/wildlife habitat I've been planting since last season. Up to about 1,300 sq ft right now and laying down tarps for another 1,000 sf next year, along with an additional pond. Great for people just getting into natives when you can walk them through the garden and show them the plants in bloom and the wildlife attracted to them. The nursery is full sun with gravel soil, so great drainage. Nothing gets watered aside from the initial planting, so it's a testament to their durability. WYP: Tell us about the meadow project you’ve begun with your brother (featured on IG). Where is it, for starters? WYP: Who initiated the collaboration? JJ: We were all into bugs as kids growing up. His family had just moved into the house and I had just started the nursery. At this point, I was fairly far along in converting my yard to all natives and he had witnessed the results, namely the caterpillars we were regularly finding on our plants (spicebush swallowtail, monarch, etc.). He basically wanted his kids to have the same opportunity as we did in terms of exploring the insect world and realized it started with the plants. That, and the property (while a nice size lot) needed a facelift both inside and out, and we figured this was a great opportunity to do something completely different compared to what was the standard in his development. WYP: Besides planting a native garden, what were your primary goals/ideas? JJ: Number one was to see what the deer would and wouldn't eat. There are TONS of deer in this development and they have no reservations about munching on people's gardens in broad daylight. Of course, we were limited to what I was currently growing at the nursery but started with a nice mix of wildflowers and grasses, and I put in a few spicebush (to attract the spicebush swallowtail, and because I've been to preserves with massive deer populations where spicebush was the dominant understory shrub). He took care of clearing the slope for planting and it was up to me to lay everything out. I'm typically more of an informal, mix and match landscape designer. For this slope, I figured I'd have to keep things less "wild" or naturalized-looking so more neighbors could buy in, or at least not complain to the HOA about a hill of weeds. In some sections, I interspersed different species. In others, I planted them in "diagonal sweeps" (not really sure how to describe this, where different species were planted next to each other in diagonal runs), including conoclinium coelestinum, monarda fistulosa, and monarda didyma. In one corner, I mixed asters (new england/aromatic) and goldenrod (gray) to ensure fall color. In the middle I tried different grasses, like little bluestem and purpletop. Mixed in some pycnanthemum species (a must for pollinator gardens) and milkweed, along with some yellow color from helianthus helianthoides and rudbeckia laciniata. We used free mulch from the township (since it was created from yard waste from a neighborhood that uses plenty of fertilizer/herbicides/pesticides, I would have preferred to purchase) and left it to him to water during dry spells. WYP: What were some of your biggest concerns and considerations with the site? JJ: Biggest concern was deer. Since it was full sun, I was confident in the species as long as there wasn't anything toxic in the mulch, and since I knew he could stay on top of watering. Really wanted to get blooms throughout the growing season to try to sell his neighbors on the design. Also selected species with interesting seedheads for winter interest since the plan was to leave the cutting back until April/May when the weather breaks. WYP: What were your biggest growing pains? JJ: For the first full season, the deer were a major problem. Anything listed as deer resistant turned out to be the opposite. A hungry deer will eat anything, even milkweed and spicebush. Just when plants were starting to put on some growth, they would get chewed back. There were still a good number of blooms, but on stunted growth. The grasses and many of the asters had the least amount of browse damage and did a lot for filling out the space early on. The following spring, the deer were at it again. We looked into putting up a deer fence but there were regulations that prohibited it. Out of desperation, he picked up a bottle of Deer Stopper online, advertised as all natural and organic, and that really worked. Big concern was whether it impacted insects and it turned out to be OK. He sprays it on once per month and the hill has finally filled in. Tons of pollinators and he raised monarchs on the milkweed this year. WYP: What wildlife is present now that wasn’t before? JJ: Like anywhere else I've used a similar mix of perennials, there are TONS of pollinators. Really diverse mix of bees, wasps, hornets, flies, butterflies, skippers, moths, etc. Goldfinches and other songbirds can be seen this time of year feeding from the spent seedheads of echinacea and other species. Dragonflies are common, as is usually the case when the insect population spikes. He just got his yard certified as a “Wildlife Habitat” (https://www.nwf.org/Garden-For-Wildlife/Certify.aspx) from National Wildlife Federation and posted the sign. It's not exactly a neighborhood full of foot traffic, but he shared a story about one of his neighbors - an older woman - who is always stopping by with a camera. He talked with her one day and she said she's never seen so many butterflies and loves taking photos of them. Just a perfect setup and conversation starter for what we're trying to accomplish. JJ: The kids are really into the bugs. As I mentioned, this was their first year raising monarchs, so they got a kick out of that. Just seeing the birds and hearing the buzz whenever you're in earshot of the meadow planting, knowing there's so much life in that area when there isn't in a lot of the neighbors yards. Whenever we go in to visit during the summer, the mowers/blowers start up around 9:00 and don't stop until early evening and this is a peaceful spot to be in whenever there's a break in the motor action. WYP: What’s the long-term plan for the site? JJ: Keep planting. We're going to keep expanding meadow up the hill and closer to his house. He'll keep some grass out front for the kids to play on, but really doesn't enjoy getting out there with the push mower. We planted some small oaks and maples a few years back, so they'll start filling out and then we'll add some understory trees and shrubs. In the back, he has some taller grasses going like Indian grass and little bluestem. Just trying to get some more aggressive species in and taller species like hollow stem Joe Pye to fill out anywhere that reduces the lawn he needs to mow. Will probably put in a wildlife pond at some point (no fish or pumps, primarily to attract reptiles/amphibians/dragonflies and a spot for birds). I have one in my backyard, and despite living in the city have a thriving green frog, toad, and dragonfly population. WYP: What are you up to now? JJ: I still have my day job as a web developer, but weeknights and weekends - pretty much all of my "spare" time is dedicated to running the nursery. I open for retail on Saturdays and Sundays throughout the growing season. I started planting my demo garden (Instagram) last fall and added well over 1,000 more plants this season. Planting a ton of stuff right now in spaces I had tarp laid down all summer. 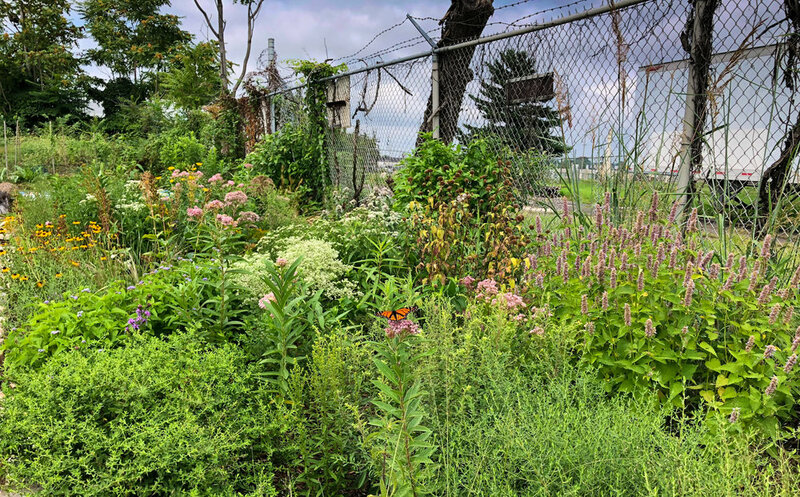 It's on a half acre lot and I've got plenty of plants, so I'm on my way to essentially creating a wildlife preserve in North Philly. Pictures don't do it justice. I'm blown away by how well everything's come in and the wildlife attracted to it. That, and it really helps when I get people new to native plants stopping by on weekends. It's tough to describe what a plant in a quart pot will look like at maturity if you put it in the ground. It's so much easier when we can just go out to the demo garden and I can show people what each plant will look like if planted in the proper conditions. I have lousy soil, plenty of weeds, can't water during the week, but the site has full sun and good drainage. The success of the plants is a testament to how well natives perform in their regions without human intervention (outside of weed pulling each week, of course). I've also been doing a handful of talks/presentations each year which have really been going well. WYP: What do you think is the key to inspiring more people to transform their yards into native habitat? JJ: You just need to convince one person to get on board, and then to do it right using organic gardening principles and proper planting techniques. Seeing is believing - not just the idea of a beautiful garden, but all of the pollinators and wildlife these plants make possible. I've said it hundreds of times - If you plant it, they will come. If you don't, they won't. People just need to understand the connection between plants and insects in the ecosystem and food pyramid. This time of year you have most people going out to Lowe's/Home Depot to load up on mums. It's nice to sit back and do nothing but enjoy the fall color of asters and goldenrods and everything else that blooms late in the season. It's like the grand finale of a fireworks display. There are so many species in bloom throughout the summer and just as their blooms are finishing you get hit with this dazzling array of blues/purples and gold. And the monarchs will be stopping for nectar through October. There's a misconception that you can just plant natives and never have to worry about maintaining them. There's some truth to this, like how nothing in my demo garden received irrigation aside from when it was first put in the ground. There will always be weeds, although less and less as the good stuff gets established and crowds them out. You do need to select plants that will work in your conditions and there are basic principals of design to adhere to, but these plants don't need to be babied once they're established. I've spent hundreds of volunteer hours pulling invasives and planting natives in city parks. Many parks don't have the funding necessary for upkeep and rely on a small number of volunteers. It's extremely difficult to win the battle against invasives in large spaces like these. In your yard, however...anyone can keep up with that, and it's contagious once people see what you're trying to accomplish. When I got mine going, I made sure to display every certification sign available so people knew what I was up to if they didn't catch me outside to start a conversation. A few years later, about 7 or 8 of my neighbors have gone on to plant native in their yards. So one yard can turn into a wildlife corridor pretty quickly once the word gets out. John Janick runs Good Host Plants Nursery. If you within a few hundred miles of Philly region and want to get wild, John’s nursery is a fine place to start.